Potato and egg breakfast tacos were my lunch staple all through grade school. My mom would make them for all us kids, and send us off to school with these wonderful tacos wrapped inside a brown paper bag. By lunch time they were cold, but you’ll find, as I did, that they are delicious, hot or cold. 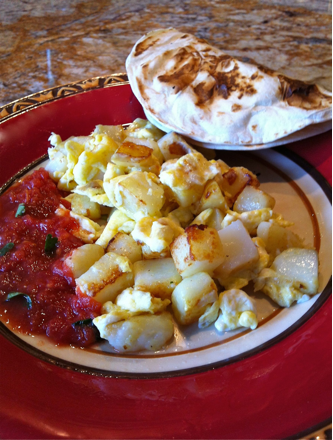 For breakfast, I usually serve papas con huevo on a plate with hot, wheat flour tortillas and a robust salsa like Chile de Arbol Salsa. Of course, they invariably will be formed into a breakfast taco, the way God intended. Notice that the flour tortilla on the plate is fully cooked, pliant and fluffy. This type of tortilla is served in every Mexican American home from Houston to Brownsville. 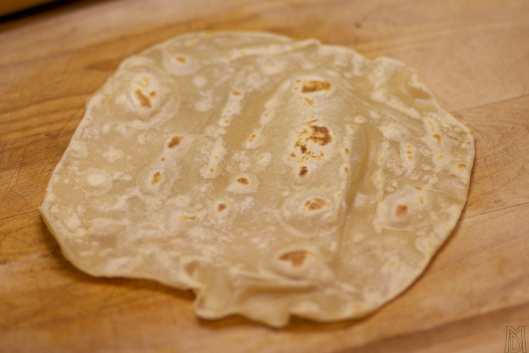 It differs from many Tex-Mex restaurant tortillas (pictured on the right) that are served only partially cooked, with many spots of raw dough. I don’t like those. Flour tortillas and tacos are not exclusive to Texas and northern Mexico. They are served in migrant farmworker camps in the fields of Michigan, Minnesota and Iowa. Making them by hand is an art. 1. Peel the potatoes and cut into half-inch cubes. Set aside. 2. Fill a large pot with water and bring it to a boil, and then add the potato cubes and cook for 5 minutes. By that time they should be partially cooked. Take a cube out and test it, cutting into it to make sure it is still somewhat firm in the center. If it is too hard, let it cook for another minute. Drain in a colander. 3. In a 12-inch skillet, preferably nonstick, heat the oil over medium heat. Add the potatoes and let them heat through. 4. Crack the egg and egg whites in a bowl, add the salt, and scramble them slightly. Add them to the potatoes, stirring to combine well, and cook until fully cooked, firm but still moist. Add salt according to your taste. Breakfast tacos and wheat flour tortillas are a Texas Mexican heritage that originated with the Jesuits bringing wheat to northern Mexico and Texas from Mesoamerica where they had been planting and harvesting it since their arrivel there in 1572. The Jesuits are credited with bringing wheat to the Texas Mexican region. Franciscans and other religious orders took over the production after the king of Spain expulsed the Jesuits from Mexico (“New Spain”) in 1767 because they continually opposed the forced labor of indigenous peoples and thus interfered with evangelization.